Archery is an activity where you shoot an arrow from a bow. This activity and the bow is one the most archaic activities and weapons of humankind know to be developed in the Upper Paleolithic. It was developed independently in different cultures and times and replaced the spear throwers as a projectile unit. Archery traditionally was used for hunting and warfare. 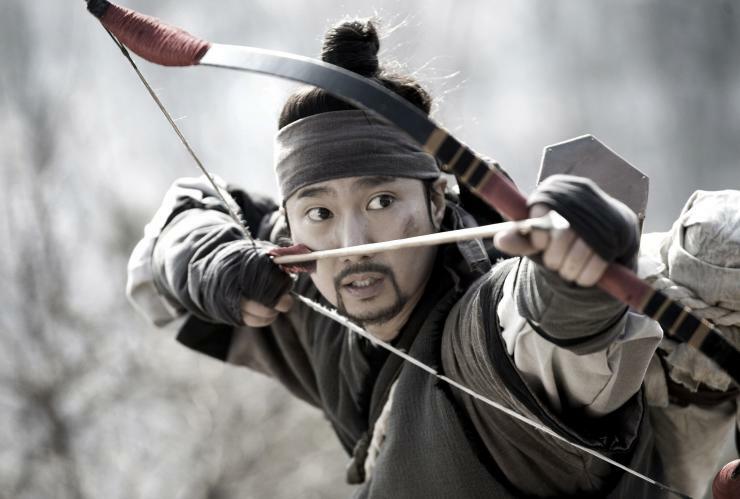 Today, you will see archery as a sport as well, it is even in the Olympics too. At Falcon Archery Malta, we focus on the historical aspects of archery and the traditional way of shooting with a bow. This means we use replicas of bow from different ages and culture and we use wooden arrows, just like our ancestors did. We don’t use middle shooter bows as it is more like a sportbow nor carbon arrows that are modern inventions. Not only the bows and arrows are different between cultures, but the way how they were shooting and how they used the bow and arrows. 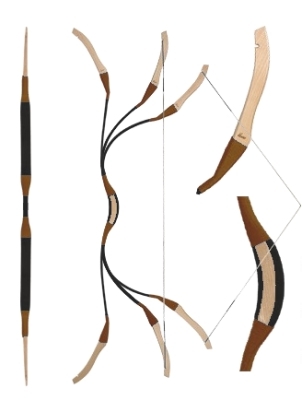 Let’s see two major types of the bows: the Longbow and the Composite, Recurve Shortbow (or Horsebow). Okay, let us see first what are the words mean! First, this bow is a shortbow as usually the maximum length is no more than 150cm, but average (depending on the culture of course) they are between 110-140 cm. 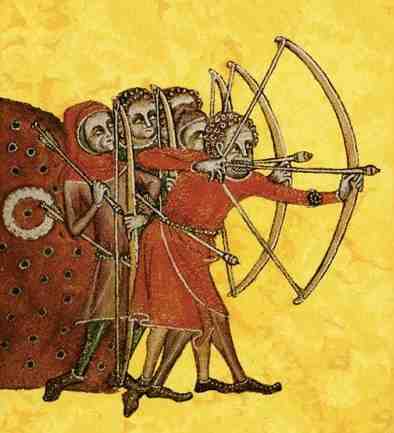 They were developed, so the archers could shoot from the horseback, hence the name Horsebow. The core of the bow is similarly to the longbow is wood. However the shorter length of the bow makes it to break if one pulls it as the angle of the bend will be bigger. To solve this problem the bowyers (bow makers) started apply sinew on the outside of the bow that strengthens the tissues and doesn’t allow them to snap. While this helps, it slows done the bow somewhat it makes it more ‘lazy’. To help with this problem, they applied small horn plates cut from the horn of animals. This gave back the springiness of the bow. As we can see, this type of bow is made of three different material, so that is why it is called ‘composite’. The last word to explain is the ‘recurve’ as you could see on the picture, this bow is not straight as the longbow when it is not strung, it has certain curves. The curves in the arm of the bow is actually position the arm beyond the vertical line of the bow. As you could imagine with the help of the picture, when you shoot, at the point of the string arriving to the body of the bow, the forward bent arms give an extra pull to the string, further increasing the acceleration of the arrow. These bow were used primarily from horseback, that required other technique while shooting and loading. For bigger control over the arrow and steadier release these bows were used with the so called thumb release. The thumb was hooked into the string underneath the arrow and the index and middle finger closed on the thumb. This also locks the arrow in place so the archer was able to shoot even keeping the arrow on the bottom side of the bow (see picture). Since this technique uses only one finger for the pull, all the force is stressing the thumb. To protect it and make pulling stronger bows possible they introduced the ‘thumb ring’ that is a distinct mark of a archer shooting with thumb release. The Longbow is a primitive bow as it is very simple to make. You just need a long enough straight piece of wood and a string and you have a longbow. Hence the other name ‘stick bow’. One of the most famous longbows are the English longbows and archers are the Welsh and English longbow-men. They mastered the making and using of the longbow, mainly using yew wood. The yew has excellent properties for a bow as the sapwood can resist stretching quite good, while the heartwood is excellent in coping with compression. With a right cut of the wood, one will have an excellent bow material. 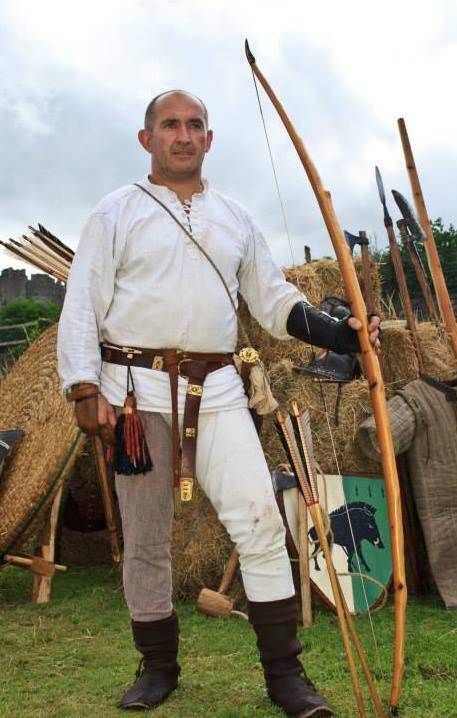 The Welsh and English longbow-men became legendary, as acquiring the right skills and strength, their bows were as strong as 130-150 pounds (called warbows). They were used in the middle and later medieval times in large numbers, one of the most famous battle where the English bowmen proved their effectiveness was in the Battle of Agincourt in 1415. Having said that the Composite Recurve Shortbow was far more effective compared to the longbow, that was one of the reasons why the Magyars (Hungarians) were easily beat the European armies and march up to today’s France in the Xth-XIth century and the mongols achieving similar success later in the XIIIth century using the similar Horsebow type. As for the technique for shooting in English or Mediterranean style is to pull the string with three fingers, the index finger goes above the arrow and the middle and ring finger below the arrow. In this video you can see how a historical re-enactor revives how a nomadic warrior used his weapons from horseback.